Travel by coach from Folkestone to Amsterdam via Eurotunnel or ferry, and embark Rex Rheni. Enjoy a welcome reception and dinner as you spend the evening cruising to Beverwijk. Gardeners! 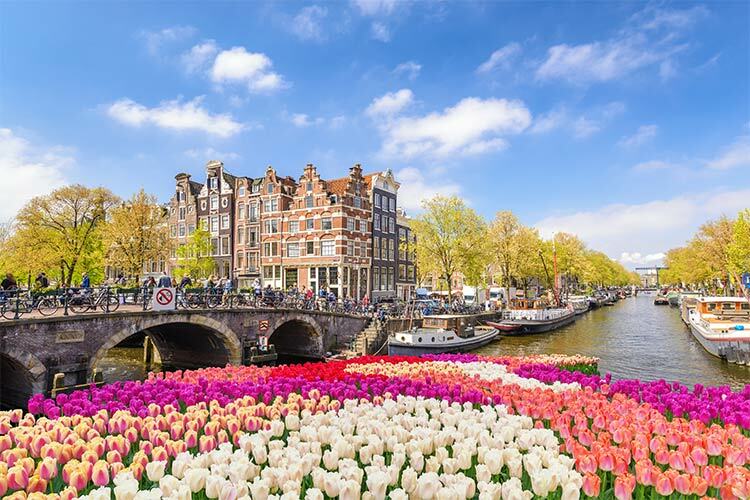 You'll love this included full-day excursion to world-renowned Keukenhof gardens, which are ablaze with colourful flowers during springtime. It's the largest bulb flower park in the world covering 32 hectares, with 4.5 million tulips and over 87 different varieties of trees. The exhibition is an annual event lasting eight weeks and featuring various activities, themed displays and a flower parade. During your visit you can view flower and plant shows in the pavilions and pick up ideas for your own garden from the seven themed gardens here. It also contains the largest sculpture park in the Netherlands. Rejoin your ship at Zaandam this evening. This morning explore Zaandam independently or join an optional tour to see the the historic village of Zaanse Schans. The Zaan region was an industrial area and its hundreds of windmills were used in the production of a wide variety of different items. See the traditional houses, warehouses, workshops and reconstructed windmills and you'll get an idea of what it was like to live here in the 18th and 19th centuries. Spend a relaxing afternoon cruising to Enkhuizen. Discover picturesque Enkhuizen this morning, a town made wealthy by its association with the Dutch East India Company. Amazingly, much of the land in this part of the country is land reclaimed from the Zuiderzee. You depart at midday for Hoorn, where you can join an optional walking tour. Enjoy exploring the winding streets and market square of the attractive harbour town where the founders of the Dutch East India Company had their houses and the trade brought great wealth – as you can see in its historic buildings and the Westfries Museum. Moor here in Hoorn overnight. Sail to Amsterdam, arriving around lunchtime with an afternoon to explore. It's easy to make your own way around this compact and pedestrian-friendly city – perhaps explore the Royal Palace, discover the wealth of art in one of the museums, see Anne Frank House or admire the paintings of Van Gogh. Or you might like to join an optional city tour and a canal cruise that fits in as much sightseeing as possible! Disembark Rex Rheni after breakfast for your return journey to the UK.